In 2018 WAYO initiated a commission for a female-identifying, Australian composer to create a new work. The selected composer will be invited to write a ten-minute piece for full symphony orchestra with triple winds, to be premiered by our flagship ensemble (WA Youth Orchestra) in Perth Concert Hall in July 2019. Gender imbalance in Australia’s professional music sector continues to be perpetuated by the programming choices of our major symphonic performance organisations. WAYO acknowledges this lack of parity, and is working towards correcting this through a focus on equality at a grass roots level. This commission has been designed to offer a female professional the opportunity to write, rehearse, and perform a large-scale orchestral work in a high-profile performance setting, whilst maintaining creative autonomy over her work. The work will be premiered alongside a program of key Australian works, featuring Jandamarra, Sing for the Country: Ngalanybarra Muwayi.u. A work of immense scale, complexity, and historical significance, this two-show performance will be the Western Australian premiere of a pinnacle Australian composition. An epic tale set in the dramatic landscape of the central Kimberley, WAYO will join forces with youth choirs, soloists, and an Indigenous ensemble of musicians and actors from co-authors, the Bunuba People, to bring this story to life. This commission offers a unique opportunity to complement and respond to a landmark Australian work. Originally from the Southern Highlands of New South Wales, Melody recently relocated to Melbourne via the USA, where she completed her Doctor of Music, to take up a full time post at the Melbourne Conservatorium of Music. Her work draws on both multi-media and traditional instrumental contexts, as well substantial extra-musical references to a broad range of philosophical topics and late 19th Century literature. Recent commissions include a percussion and choral work for Synergy Percussion + Vox, the Chou’s composition award commission, the Australian Youth Orchestra, Inventi ensemble, as well as being a composer resident at the Aaron Copland House in May 2016. Melody is currently penning works for the Tasmanian Symphony and Philadelphia Orchestras. 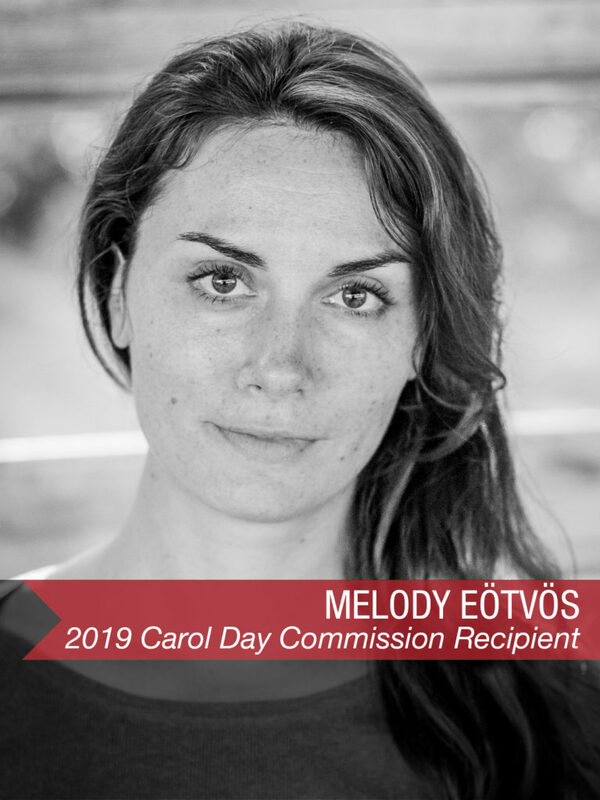 One of Australia’s most auspicious voices in contemporary classical composition, WAYO is honoured to support Melody through the Carol Day Commission. Look out for the world premiere of her work for WAYO on July 13 & 14 at Perth Concert Hall. Get to know the composer as we chat with her below! 1. Why do you compose? Ever since I was about 14 years old I realized that I could still have a life in music and not have to be a performer – I got terribly nervous on stage and transitioning to writing music came so naturally to me, it just made sense. From that point onwards I only ever performed my own music or another composition student/colleagues within an ensemble setting. 2. Can you tell us about the first piece of music you ever wrote? The first piece I actually wrote was when I was 8 years old. It was called “The Haunted Grandfather Clock” and it was extremely dissonant. I wrote it for Piano and Cello (I had been learning cello for a year at that point) and used an amazing amount of minor seconds. 3. What do you think makes your music/sound uniquely your own? I think I have a tendency to latch on to certain concepts and ideas within a source of inspiration (such as a book or a biological phenomena) and project a sound world onto it based on specific details and characteristics of the thing, and this inspires a very particular sound world that hopefully absorbs the listener in convincingly. 4. What, outside of music, most inspires you and/or your work? I’m a huge proponent of branching out into as many areas of study and life as possible, so I’m always reading something new or learning a new concept and I find this inevitably makes its way into my music somehow. The areas that most inspire me though are philosophy, turn of the century (1890 – 1910) history, life sciences, and the natural world. 5. Where and how do you work? Normally I would work from home, at my piano/desk/computer combination, but recently I moved from the USA to Australia and sadly had to give up my piano (hoping to replace it asap!! ), as well as taking up a new academic position at the Melbourne Conservatorium of Music. So, my music making space will probably be split between my Southbank office and home now. So far as the ‘how’ is concerned, I find it best to have an instrument on hand (preferably a piano for orchestral music, or if writing for anything specific then the actual instrument…I have collected quite a few over the years! ), then to draft on paper; but if I’m pressed for time I’ll occasionally go straight to the computer (providing the clarity of an idea is there). 6. What do you think Australian listeners think of ‘new music’? What about new music excites you? I’m not too sure at this point – there’s a lot about the ‘local’ perception of new music that I haven’t been able to get in touch with since moving to the States nine years ago, but now that I’m back the centre of a major arts community again I look forward to discovering the answer to this! As for what excites me about new music: I love discovering a new composer and hearing something new and unique – many times throughout my life I’ve heard the old ‘there’s nothing new possible anymore’ and I couldn’t disagree with it more! 7. If you could invite any composers, living or dead, to a dinner party at your house, who would they be and why? Without a moment’s hesitation, Bartok! Purely for the love of it. And then out of curiosity, to see what he thinks of modern pop music, Mozart. I do have one more choice: Peter Eotvos! Besides the fact that I adore and respect his music and work as an educator, I think having the opportunity to guarantee a meeting in a relaxed dinner setting would potentially solve the mystery once and for all as to whether we’re related or not (even though I’m fairly certain that we’re not). 8. What life event has most affected/changed your music? This is still an easy one to answer: Back in 2003, during my undergrad (at the Queensland Conservatorium of Music) I had the very good fortune of taking a post-tonal analysis class with the recently appointed Dr. Gerardo Dirié. I decided pretty quickly that I needed to study composition with him and by the following semester I was taking lessons with him. Gerardo completely unleashed my perspective on composition, literature, philosophy, and moving forward in my life as a composer. I still think myself lucky for ever having the opportunity to learn with him! 9. Why is it important to support women making music? It is crucial to provide support to women composers because we clearly are an underrepresented group in our field, and all across the world more and more organizations are doing their utmost to help this. I still very strongly believe that more guidance and presence is needed for the high-school-aged students. The young women of this age need to understand that composing is a viable path forward as a musician and artist. If they began their training/learning/explorations in a secondary school environment that supported their ambitions I think we would see a more balanced (if not greater!) proportion of emerging women composers coming through the system. 10. What’s one thing you want emerging composers to know about choosing a career as a composer? You need to look after and nurture your connections and the network you start building from day one. It will pay off – maybe tomorrow, maybe in a year, or maybe in ten years! When it happens doesn’t matter, only that you maintain those relationships and meaningful connections that you make with other musicians, artists, managers, teachers, etc. And remember to treat performers like the real, wonderful people that they are (not just as a body with an instrument playing the piece you wrote! ).